The Bennington Water Resources Division formed in 1987 consolidating the Bennington Water and Wastewater (Sewer) Departments. This is now consolidated with the Highway Division to form the new Department of Public Works. The Water/Sewer Divisions budgets are soley funded through the system users and the rates established annually. No real estate tax money is used for any part of either departments needs. The Water Division is made up of a five-man crew. 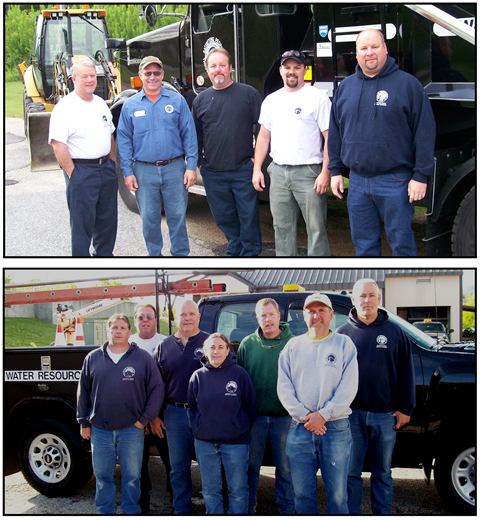 This crew is responsible for servicing and maintaining approximately 62 miles of water mains, 500 fire hydrants, 3,700 water service connections and 1,150 water meters ranging from 1/2 inch to 8 inches in diameter. They also are responsible for the maintaining the 4.0 million gallon per day Water Filtration Plant. The Bennington water system is fed by two different water sources. Our primary water source is Bolles Brook, a surface water source located in Woodford, Vermont. It is necessary to treat this water before consumption and is done so at the Water Filtration Plant on Route 9 in Woodford. Our plant was originally built and put on line in 1978. This Filtration Plant went through a major upgrade in 2006 in order to meet new criteria set forth by the E.P.A.’s as they related to the Safe Drinking Water Act. Bennington’s second source of water is Morgan Springs. This is a pristine ground water source located right in the Town of Bennington. It is an extremely valuable resource to both the Town of Bennington and it’s water users. This amazing spring overflows nearly 2.5 Million Gallons per Day. In 1992 Morgan Springs was upgraded to a state of the art ground water pumping station and withdrawal facility. In 2004 the Town of Bennington Water Department made additional upgrades to facilitate the sale of Morgan Springs Water to private water bottling companies, which continues today. Projects in the near future will be focused on the replacement of 100-year-old water main sections and the improvement of water quality through larger diameter water mains as well as looping the water mains where possible. If you have questions regarding your water service, billings, permits for repairs, allocations for home additions or new businesses or water meters please contact the Water/Sewer billing office at the Town Offices at 802-447-9719.